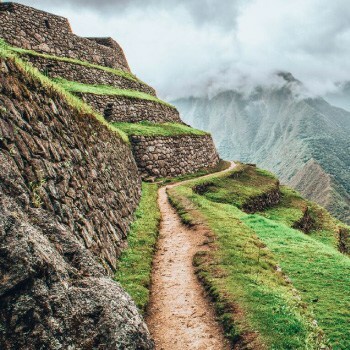 With its towering peaks, exotic jungles, beautiful beaches, delicious food, ancient ruins and thousands of years of history and culture, Peru is a diverse country with new things to discover in every corner. 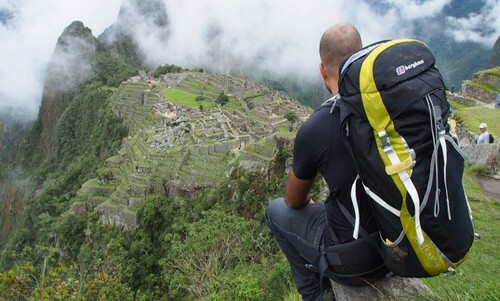 Here is a guide to Backpacking Peru with a tight budget and still getting the most out of your money, enjoying the best Peru has to offer. Hostels in Peru are exceedingly cheap, and can go for as little as S/. 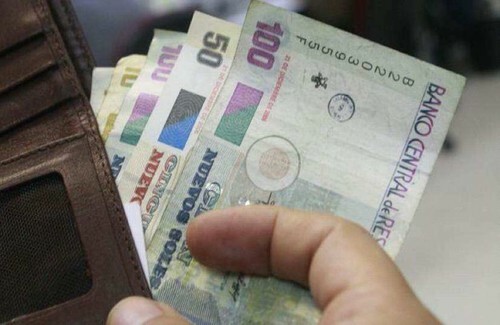 20 (6.10 USD) a night, though typically, they’ll be closer to S/. 30 (9.15 USD), and will usually have hot water, wifi and some sort of kitchen for cooking food, as well as a nice breakfast for an extra fee. It should be noted that in any major city you’ll find hundreds of small “Hostals” in every part of town, especially near commercial areas, often charging as little as S/. 10 – 20. These are not the same as Backpacker’s hostels. “Hostals” cater to young lovers looking to spend the night together. While most are perfectly safe, they are often a bit dirty, only offer 6 hours of stay, and have no extra services. 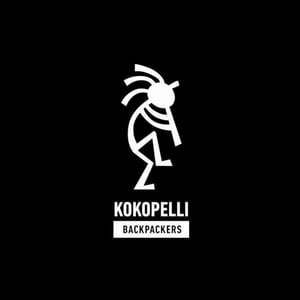 Kokopelli is very popular with the hard-partying set and has branches in Lima, Cusco, and the resort town of Paracas. Another popular chain, available in Lima and Cusco, is Pariwana , which runs for a bit more than its rivals, but makes up for that with world class backpacker accommodation and service. For the more laid back and quiet sort not looking for a party place, Flying Dog has locations in Lima, Cusco, Arequipa, Urubamba, and the jungle city of Iquitos. Flying Dog prides itself on offering spacious, relaxing spaces and quiet accommodation. 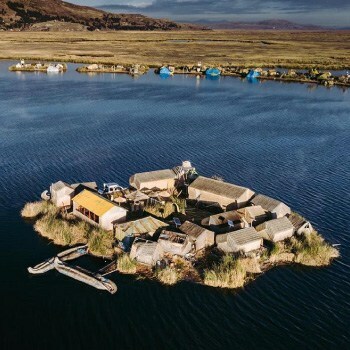 In Puno, the jumping off point for visiting the wonders of lake Titicaca or taking an excursion into Bolivia, Iguana hostel is popular for its cleanliness and extremely helpful and friendly staff. In smaller towns, hostels can be harder to find, but family run “hospedajes” offer an excellent alternative for the budget traveller, especially if you can manage enough spanish for basic communication. Several hostels along Peru Hop’s route offer special deals and discounts to our riders. 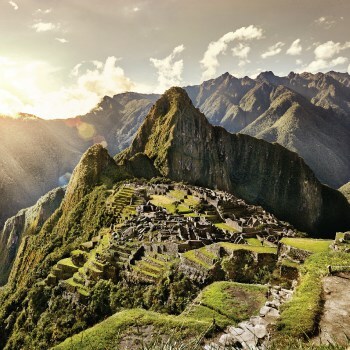 Peru is rightly famous for and proud of it’s amazing cuisine, and is known as the kitchen of Latin America. 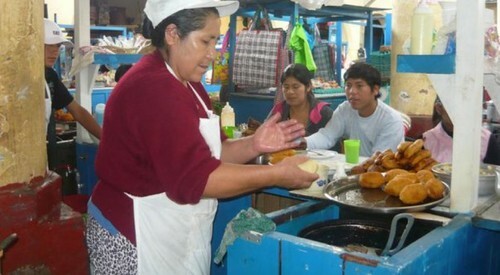 Fortunately for backpackers, the food of Peru is also very affordable. One excellent option for a substantial and delicious lunch is finding a place that offers a “Menú”. A “menú” is a set of options for an appetizer and a main course that changes day to day, and usually comes with either chicha or juice. A menú usually runs for S/. 9-15 (3-5 USD). An option for the more daring are the various food carts that are ubiquitous on street corners, and rarely charge more than 5 soles for a drink and snack. A very common breakfast from a food cart is a roll and a cup of “kuaker” -oatmeal made peruvian style, which is thinner and more watery than usual and consumed by drinking rather than eating with a spoon- for 2 soles. If you ask for “yapa” you can usually get a free refill of kuaker. Another food cart favorite, especially in Lima, is Papa Rellena, a mashed potato stuffed with meat and fried to be crispy on the outside and soft on the inside. Most hostels include a kitchen useable by guests, so if you have a knack for cooking or are willing to learn, you can save a lot of money by buying fresh ingredients at a local market and preparing your own food. 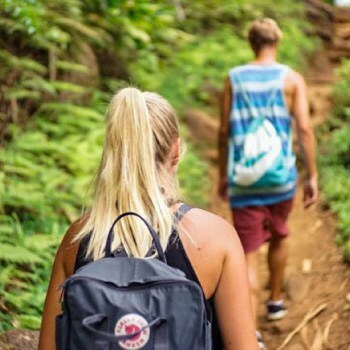 If you’re the generous type, this is an excellent way to make friends with other backpackers as well. The most common way for Peruvians to get around their cities are either by taxi or crowded “Combi” minibuses. Though you can get nearly anywhere in town by combi, the system is chaotic and takes a bit of getting used to. For a travel in larger cities, download the free “Tu Ruta” app, which shows routes, approximate arrival times, the best stop to get off at, and a picture of the bus you need to take. Combis can also be a bit crowded at times, but once you get the hang of the system they’re a great way to get around town and very cheap. 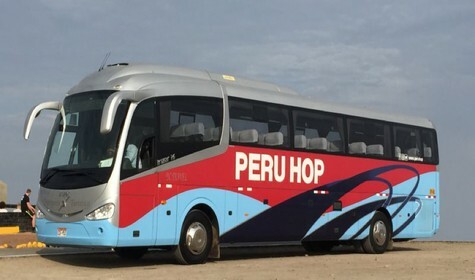 The best way to travel through southern Peru, where most of the attractions are, is by Peru Hop’s hop on, hop off service from Lima to Cusco and back, with many fascinating stops along the way. One ticket lets you get off at any of the stops you like, and spend as much time as you please before hopping on the next bus continuing on your journey. A careful backpacker can easily get by on $25-30 a day, but it’s always smart to bring some extra for emergencies or last minute changes of plans. 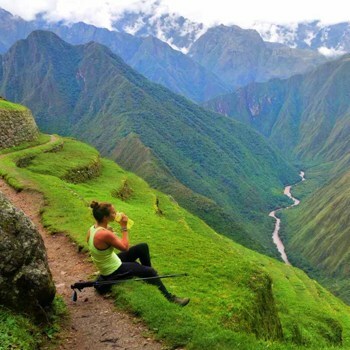 Sites such as FindLocalTrips are an excellent way to find attractions and tours throughout Latin America on a budget while avoiding unscrupulous tourism companies that exploit the local Peruvians. If you speak a bit of Spanish you’ll save money at markets and such as well, since you’ll be able to haggle with the sellers. 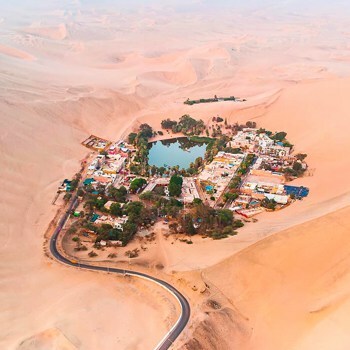 Hostels.com and Booking.com are good resources for finding hostels in an area, but they are sometimes missing towns and outdated, so cross reference with sites like Tripadvisor.com to make sure you’re getting the best deal available. 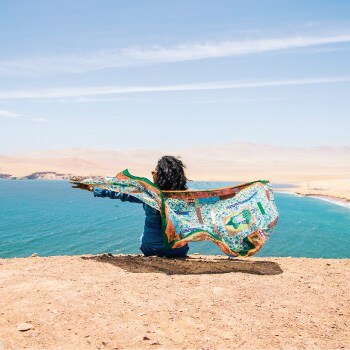 Couchsurfing is also beginning to take off in Peru, and can make an excellent alternative to more traditional accommodations, as long as you take the usual precautions mentioned on the website. 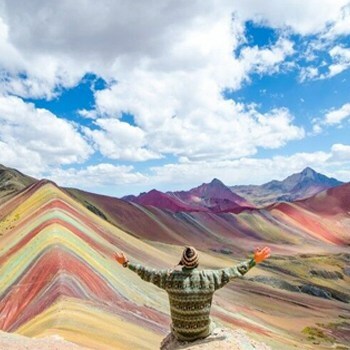 Peru is a wonderland for backpackers, and if you follow these tips and do your research before you go, you’re guaranteed to have an amazing time for far less money than you would spend in Europe or North America.